Two Year Old Baby Was Abandoned By Parents in Fear that He's a Witch! Parents should always be the caretaker of their children until it reached the right age to separate himself to his family. But in Nigeria, one child has been rescued after his family abandoned him in the streets because of the fear that he's a witch. According to the reports of the Daily Mail, The poor child was left to fend for himself for eight months, surviving off the scraps thrown to him by passers-by. 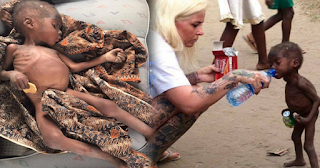 Thankfully, this Two-Year Old boy was found and taken care of by a Danish aid worker named Anja Ringgen Loven last January 31. This Boy was renamed as Hope and received urgent medical attention for malnutrition and to help get rid of his worms. Watch the full report and see what happens after.